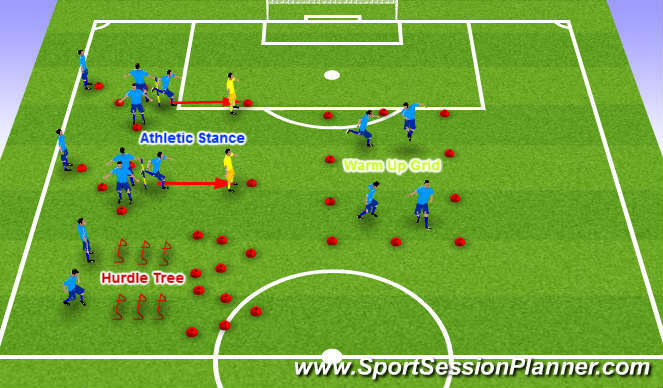 Warm Up Grid - jogging, changing direction, jockeying, Squat to Jump, Carioca, dyanamic streches. progression introduce a ball. Teaching Points - Straight back Soft bend in knees. Athletic Stance - starts on bum get up as quick as you can, touch the pole then, i give a direction e.g. right or left, then jockey right or left depending on direction given, then run to far cone, then peel off back to the start. Hurdle Tree - hop the hurdles, touch a coloured cone depending on the colour given, peel off back to the start. progression: single leg hop over hurdles, alternate, touch colour cone left or right given direction. Teaching Points - Focus on foot accuracy, soft bend in knees, straight back.